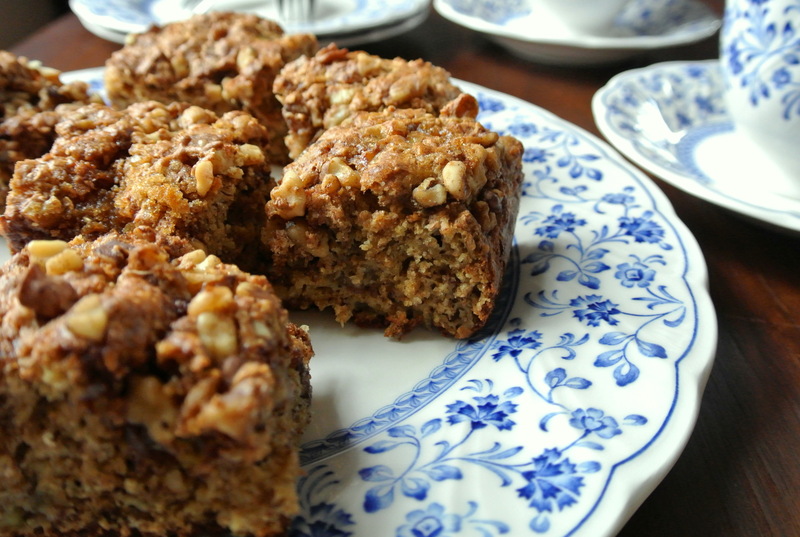 This cake is only slightly sweet, is made with whole grains, contains no oil or butter, and is packed with bananas and nuts, which makes it appropriate breakfast food in my books. 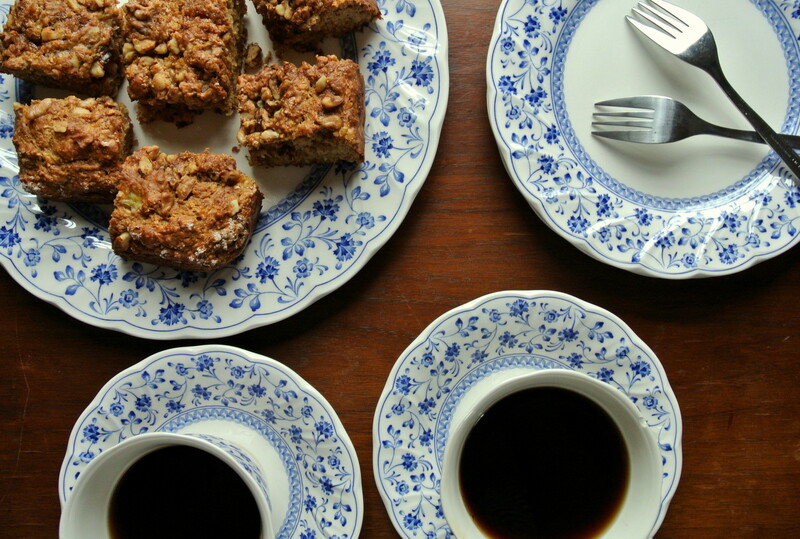 The caramelized walnut-sugar streusel is candied and crunchy, contrasting with the soft, barely sweet cake. Made using only whole wheat flour, the cake is a little dense, as you’d expect, but the sour cream makes it surprisingly moist and lightens the texture considerably. 2. In small bowl, mix together streusel ingredients (walnuts, brown sugar, cinnamon). Set aside. 3. In medium bowl, mix together flour, baking soda, baking powder, cinnamon and salt. 4. In a separate bowl, mix together mashed bananas and sugar. Beat in egg. Add vanilla, sour cream and water. Stir. 5. Add dry ingredients to wet ingredients, and stir until just combined. 6. Pour batter into a greased or parchment-lined 9 x 5 loaf pan. Top with streusel, using a spoon to swirl the streusel into the batter slightly. My recipe is loosely based on this recipe from the Heart and Stroke Foundation. How delicious! I love any cake with bananas! Yum! Lovely cake. Perfect for breakfast in my books too. This looks wonderful! I am going to give it a try and will let you know how it comes out. 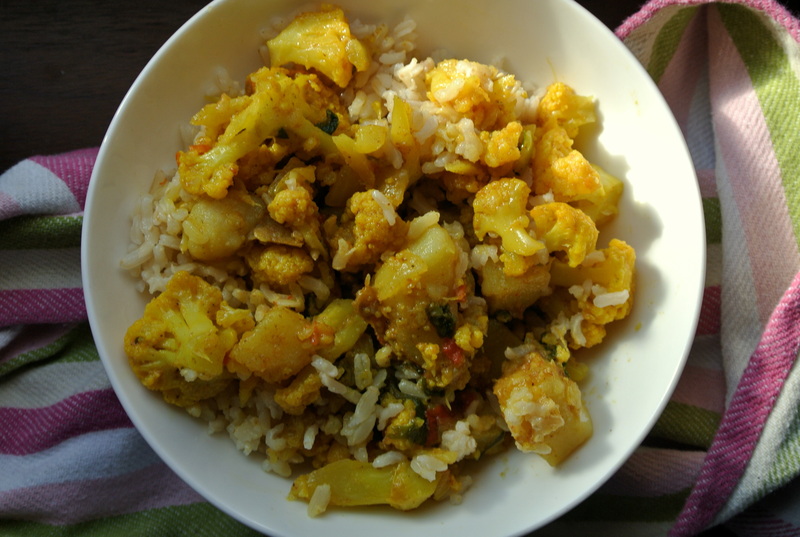 Thanks for sharing some great recipes.